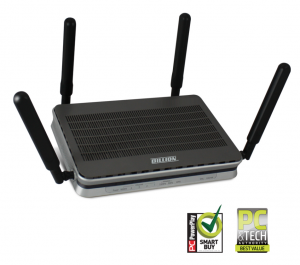 The router that we have selected for our Trooli Business broadband services is the Technicolor Billion 8900AX-2400. The BiPAC 8900AX-2400 has four Gigabit LAN ports and one Giga Ethernet WAN port that can be configured as a WAN interfacefor broadband connectivity. This EWAN offers another broadband connectivity option for connecting to a cable, DSL, fibre modem. The BiPAC8900AX-2400 again offers users convenience and optimal network performance with data rates reaching up to 1Gbps. If you need technical help you can speak to our Trooli help desk via online chat, or by calling 0800 358 7680, or you can email support@trooli.com.